Bristol was originally known as Bricgstoc (the place of the bridge). A settlement grew up around a large port on the River Avon and its importance increased after the Norman Conquest. A castle was built on the narrow neck of land east of the town, which became a Key defence of the West. Trade increased rapidly during the 12th and 13th centuries, greatly expanding the city and surrounding towns. In the 14th century it became a major wool exporter, forwarding cargoes to Ireland and the Baltic countries. 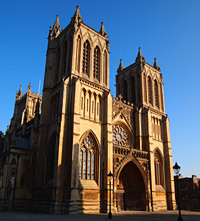 In 1373, Edward III declared that Bristol was "a county by itself separated (from the) Counties of Gloucester and Somerset equally and in all things exempt". 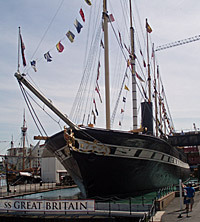 Bristol developed as a transatlantic port following the launching of Isambard Kingdom Brunel's steamships Great Western in 1837 and Great Britain in 1843. Both ships were built at Bristol, but later were forced to trade from Liverpool docks due to the higher charges imposed by the Bristol Docks Committee. There are many fine old buildings in Bristol, several of which are open to the public, such Red Lodge and Chatterton House. The 17th century inn, 'The Llandoger Trow', in King Street was once an old haunt for pirates and is believed to have inspired Robert Louis Stevenson's inn, "The Spy Glass", in Treasure Island. One of the oldest streets is King Street, a cobbled thoroughfare with many old houses and Britain's oldest working theatre, the Theatre Royal, opened in 1766 and now home of the Bristol Old Vic. The Christmas Steps Arts Quarter is another old thoroughfare, rebuilt in 1669, is where antique dealers and booksellers trade. In the old area of Bristol stands the Grade I listed 'Exchange', built by John Wood in the 18th century. On the pavement outside, are four flat topped bronze pillars called the "nails" on which merchants completed their money transactions, giving rise to the saying "to pay on the nail". The nearby Guildhall (circa 1843) stands on the site of the original medieval building. The British built version of the Anglo-French Concorde was once assembled at the BAC works in Filton, Bristol. In January, 1976, it became the first supersonic passenger aircraft in commercial service and was able to cruise at over 1,350 mph - more than twice the speed of sound. The first screw-propelled passenger ship to enter the Atlantic service. When it was launched in 1843, the 322 ft long ship was the largest in the world. She sailed until 1886, then she was abandoned as a hulk in the Falkland Islands after being almost wrecked during a storm. In 1970 the ship was brought back to Bristol on a specially constructed raft and has been restored to her former glory, in the dock where she was built. Standing on College Green, it was founded in the	1140s as the church of an Augustinian abbey, becoming a cathedral in 1542. Its Norman chapter house is one of the finest in England. Much of the original 12th-century building still survives, including the great gatehouse, the entrance to the abbot's lodging, the walls of the south transept and the east walk of the cloister. Designed by the engineering genius Isambard Kingdom Brunel, it delicately spans the rocky, wooded, 250ft deep Awn Gorge. The bridge was completed in 1864, incorporating 1,500 tons of steel, and still stands today as a monument to Brunel's expertise. Once a snuff-mill, it now contains a camera obscura which gives panoramic views of the city. A passageway beneath the observatory leads to the Giant's Cave, which opens out on to a ledge on the side of	the 250 ft deep limestone gorge, high above the river. 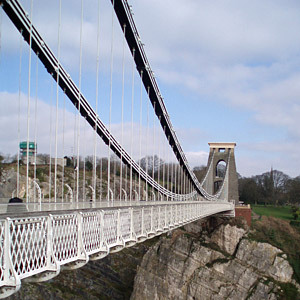 Located: close to the suspension bridge, on the Clifton side. Located on Clifton Down, it hosts a wide collection of rare animals, including white tigers. 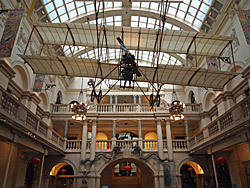 Standing next to Bristol University, the museum has local archaeological and geological relics. The art gallery	displays paintings by Sir Thomas Lawrence (a Bristol painter), plus collections of ceramics and glass. A 15th century mansion containing exhibits of west country life. Its name derives from the original Gothic castle of the same period in the grounds. There is are also a water-mill, a thatched dairy and the remains of an Iron Age hill-fort. On display are the mosaics, bath suite and foundations of a Roman country house of the 3rd and 4th centuries AD. This 16th-century house was altered in the 18th century and has carvings and furnishings from both periods, now a branch of Bristol City Museum. The Georgian House contains 18th-century furniture and fittings.